Breaking into the world of RC vehicles is as easy as purchasing the right equipment. You may not be much of a challenge for seasoned racers, but the whole point behind RC racing and performance is that it is enjoyable. It’s Earth Day today. How’s your carbon footprint? You probably know the principle of little things add up over time, so every little way that you can lower your carbon footprint helps. Here’s another “little” thing that can help you contribute to the fight against global warming – and in a fun way, too! 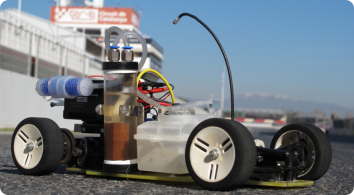 I am talking about a Hydrogen-powered remote controlled car that runs on soda can rings. Ridiculous as it may sound, I am not pulling your leg. So how does this work? Go back to the times you spent in Chemistry class. Okay, maybe you were absent when this was taught, or maybe you simply weren’t paying any attention. Get some aluminum. Then get some sodium hydroxide – otherwise known as lye. If you combines these two, what you’ll get is – you guessed it – hydrogen. That is what powers this RC car. Even cooler is that they use soda can rings – which is made of aluminum; recycled soda cans! That is rather simple, isn’t it? The main thing is how to get that hydrogen and use channel it to actually make the car run. Otherwise, you’ll just be releasing air for no reason. That’s where engineering know-how comes into the picture. The team of engineers from Spain put their heads together and got the car working! As you can see in the video, they did a pretty good job. Now playing around with RC cars powered by a reaction between aluminum and lye is one thing. Using the same concept to power road-worthy cars is a totally different story! The engineers, however, are unfazed. They are actually aiming to extend the concept to power small vehicles. Road-worthy cars may be out of the question for now, but think about those tiny carts used in golf courses or big resorts. Think about trolleys that take you around large complexes. It is not unthinkable that in the future, these can be run using recycled aluminum and lye. Awesome or what? For now, I’d settle on having my own dAlH2Orean or two. Who wouldn’t? 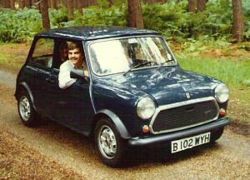 Mr. Bean drove a Mini. Minis were featured in Austin Powers films, too. And the story of the 1960’s Italian Job and the 2000’s remake revolved around the Mini. The Mini seems to have been a Hollywood favorite, especially with renowned purchases by the stars in the late 1960’s. 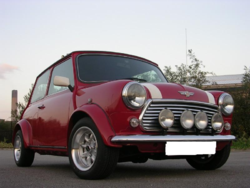 The Mini is a small car that was produced by the British Motor Corporation (BMC) and its successors from 1959 to 2000. The most popular British-made car it … is considered an icon of the 1960s, and its space-saving front-wheel-drive layout influenced a generation of car-makers. In the international poll for the award of the world’s most influential car of the twentieth century the Mini came second only to the Ford Model T.
The beauty of the Mini is in its simplicity. It was designed to contain as less parts possible, for easy maintenance. Even the suspension system used compact rubber cones instead of traditional steel springs. Space was maximized, so that even with its diminutive size, you can seat at least four full-size adults. But what was revolutionary with the Mini is the use of the FF layout–or the front-engine, front-wheel drive layout, which introduced such a layout to a new generation of cars. Most passenger cars today are FF, save for pick up trucks, most SUVs, and large sedans and wagons. The FF layout saved on space, since there is no longer the need to connect the engine to the rear wheels through a transaxle. There is also no need for differentials to be installed on the rear axle. And given the physics of running front wheels on a front-mounted engine, this also saves on fuel consumption. The Minis also had excellent handling, thanks to the FF layout and the wheels being pushed out to the car’s corners. This gave it an edge in rally racing, and in fact, the Mini has won many a championship in the 1960’s and 1970’s. The Mini has since been replaced the New MINI, manufactured by BMW. It shares some of the retro aesthetics of the original Mini but is pretty much a whole different car, in terms of size and amenities. It’s no longer the spartan, but fun vehicle the Mini was, but is instead aimed at young upscale consumers. Still, you can see Minis in various states and conditions around, and you cannot help but marvel at how such a simple little automobile represented feats in engineering and had captured the hearts of auto enthusiasts and motorists alike. For the past weeks I’ve been taking my small “movie breaks” in the car while the wife is doing the weekly grocery trip. Not a big fan of walking around Pick and Save and would rather sit in to watch my favorite film. The downside of this is when I forget to charge my iPod, and I’m left hanging in the middle of my viewing. I’ve been hunting Amazon and Ebay for an iPod charger or adaptor for my car for the past two months now and, well, I’ve seen stuff BUT wasn’t really sure if it would really work (read as “safe to use” for the iPod and my car). 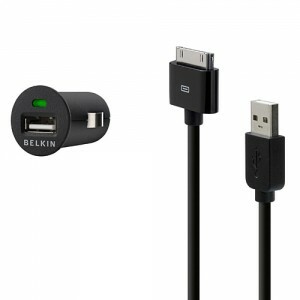 Great that Belkin (a reputable brand) has developed the Micro Auto Charger with Charge Sync Cable. This is really a great idea! It will be available in early May bundled with a Charge and Sync Cable for iPod and iPhone for $20, or by itself for $15. The Dual Auto Charger features two USB ports, one port running at 1A for fast charging, the other at 500mA, and includes a three-foot charge and sync cable for the iPod and iPhone. It is available now and sells for $30. RideLust has put together a pretty cool list of the top 5 gadgets for your car. 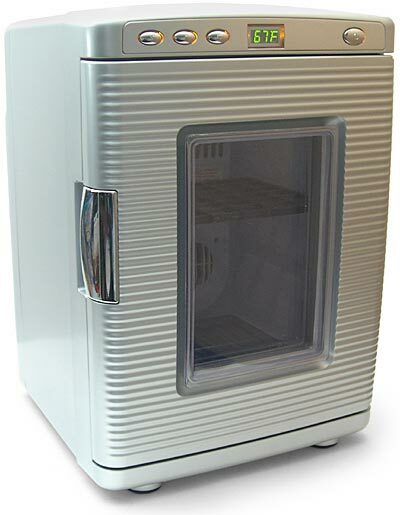 By far, the coolest car gadget on the list is the combo Fridge/Warmer. Think about it a second…. Not only can you keep your beer cold for the tailgate party, but as soon as the beer is gone, you can pop in some pizza and warm it up. Finally! I’ve been sooooo bored with my USB drives lately that I think I’m just about ready for something, well errr… unboring! 🙂 Found this via TechnaBob, thanks dude! I think they’ve landed the design really well. Mini Cooper fans worldwide will surely “hit the streets” to find these babies a place in their homes. You can check out Vavalo because they also have “mini” USB drives/things that may catch your fancy. How about a hamburger USB Drive? A fortune cookie drive? A golf ball drive perhaps? 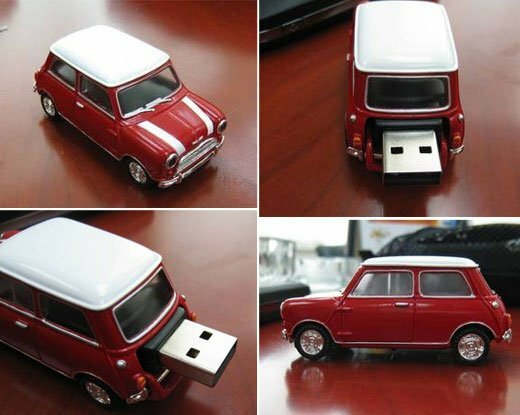 Plug the mini cooper USB drive and you’d see that the headlights turn on! Cool eh? There are other designs to choose from, but all will start shipping this August. I’d expect more color variations too. I like the yellow/green combination. Hey this will be a good gift for Christmas too, it’ll probably retail less than $50 per piece. Yeah, I know it’s still months away, but I’m guessing that this will just sell like crazy. If at all possible, grab 10 for your gadget loving friends, the boss, your dad and one for you too. For those of you who aren’t really familiar with car terminology, the Spider of this eponymous car means that it has no roof. Much like the rather famous Renault Spider in fact – a car that had massive power thanks to its incredibly low weight. This car, from Alfa Romeo (the rather famous Italian car manufacturer known for creating cars that are incredibly driver-centric but also known for, well, having Italian passion and throwing a strop every now and then) is a little different. Just like the coupe version, it is rather likely to sell out quickly. In fact, the ‘standard’ 8C (if you can ever call such an impressive, beautiful car that) sold out in just a few days. This is thanks to the unique styling (something like a real-life batmobile) and absolutely gorgeous curves. Power is derived from the 4.7 litre V8 inside a steel chassis and clothed in carbon fibre. 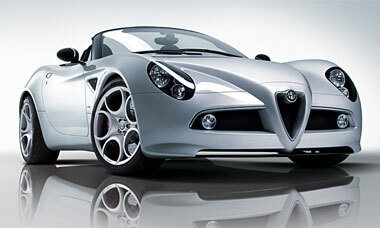 Unlike a lot of the newer models from Alfa, this will be a return to the old ‘Italian Passion’ form – i.e. we’ll see a wilful comeback of rear wheel drive. Again, for those in the know, this should provide bags of character and the option to swing the back end out in corners. Don’t bother driving it in the snow or wet. A six-speed gearbox and a limited slip diff will round off the package with a rumoured 0-60 somewhere around 4.8 seconds. Unfortunately, there’ll be only 500 in the world. Even if you can’t buy one, this is a shame, as you’ll probably never see such a beautiful car on the road either. Prices will be in excess of £100,000 no doubt. Maybe it’s just me, but do you have trouble reading the tire gauge when you check your car’s pressure? This, coupled with sheer laziness, has me filling my tires way less than I know I should. Low tire pressure is a catalyst for lots of bad stuff. That’s why I’m stoked about this Solar Powered Digital Tire Gauge. The hand-held gadget let’s you check your pressure anywhere, displaying a digital readout on a large, back-lit screen. The one-button operation is foolproof and the device automatically turns off after a few seconds. A solar recharging panel means you’ll never have to worry about batteries. But what if it’s a rainy day? Fear not! The built-in solar recharged lithium battery will keep you operating. Choose from PSI, bar, KPA, or kg/cm2 pressure settings. No more confusion. No more excuses. For about $12 US you can keep yourself and everyone else on the road a little safer. Look what you’ve done. You’ve only gone and devalued your car, increased your insurance premium, added weight to the vehicle and made it more difficult to sell in the future apart from to Barbary apes of your own breed. What am I talking about? Well, none other than car modifications! There are a few modifications that I don’t actually mind too much – and those tend to be things that go on under the hood. I have a bit of respect for you if you know how to sort out your valve timings, a stainless steel exhaust and a sports induction kit from HKS. What I won’t tolerate though is your ‘uprating‘ (read destroying) a perfectly good car but adding all manner of ridiculous plastic gubbins and fat exhausts. Over in the UK, we have the type of people known as ‘chavs’. You may or may not have heard of them, but they are either those who get a bad rap for nothing, or the lower rungs of society who like nothing better than to get boozed up, steal cars and laugh about it while rolling each other in supermarket trolleys afterwards. Anyway, you’ll tend to find that it’s the chav community who like to do up their wheels, but not necessarily so. Let’s look at a very recent example of car modification that really annoyed me. Knowing that the new style of Subaru Impreza has been released (they’ve gone from the usual saloon to a rather iffy looking hatchback), I thought this would be a good time to get a new set of rather speedy wheels. So duly off I went to the local used dealership to see what I can find. I’ll grant you, in this case I was maybe asking a bit much – a car that wasn’t too old, not too many miles and it had to be UNMODIFIED. The reason that I specify that is that the Subaru Impreza is a powerful machine, well the WRX is anyway, and the STI variants. They are the models that you frequently see racing in the world rallying stages etc. I wanted one that was unmodified so I could have the pure Subaru experience – a car to be driven as intended. Anyway, when I got to the dealership, I actually found a model I quite liked. I don’t normally go for anything too flashy, but this was in two colours. Nice. A bit like a car I made in Forza Motorsport 2 on the Xbox 360 actually. So, I took a look all the way around it. Non-standard alloys – okay, I could live with that. Fat exhaust – maybe I couldn’t live with that if the volume was too much. Ridiculous flared arches and rear spoiler (along with stickers and various other rubbish) – this I could not live with. A genuinely good-looking car had been wrecked by someone deciding that not only could the car do with engine mods (so you would be looking at less than 15MPG) but also a whole new bodykit. Don’t get me wrong, I’ve seen some good-looking modifications to cars – but these tend to be few and far between. What I think people fail to realise is that years of work has gone into building these machines – not just another 10 kilos of fibreglass. On another note, I haven’t yet got my Subaru (or Scooby as some call them). I was put off recently by an experience when I was driving back home quite late. There was a total of three lanes and some idiot came screaming up the left lane (the slower one) and shot past and off into the night. He was driving a Subaru Impreza STI – all 300BHP and no common sense I think. Generally speaking, racing (and sports performance) cars tend to be noted for a couple of things, including being extremely thirsty. The other thing is that very rarely do they deviate from the super version of standard petrol. Sure, some of them will now run on a certain percentage of ethanol, but hardly enough to write home about when they return about fifteen miles per gallon. With this in mind, it’s pretty amazing that two hugely influential vehicle manufacturers (amongst others mind you) have stepped out from the shadows with two very important cars. They are the Audi R8 and the Mitsubishi Concept-RA. These cars are important because they’re both extremely quick, whilst diesel engines of old had problems in the low and high rev range, were noisy and cumbersome (though did provide a lot more torque). So, let’s take a look at the Audi R8. Whilst the original has been out some time, the R8 shown here is the TDI version, powered by a mighty V12. This 6.0 litre powerhouse is actually faster than the petrol version, offering up 493 BHP and 1,000N/m of torque. This allows it to sprint from 0-62 in only 4.2 seconds – 0.4 seconds faster than the petrol. Amazingly, the TDI version of the R8 actually shoves out less emissions than its’ petrol brethren, injecting a urea-based solution called AdBlue into the system to cut nitrous oxide output. The other turbodiesel I’m interested in is the Mitsubishi Concept-RA. Shown recently at the Detroit Motor Show – it’s clear that the company known for the manic Evo (of all variations) is not pulling any punches with this extremely aggressive looking concept. The RA has all the lines of a sports coupe, with powerful lines and huge 21 inch wheels housed in huge arches and fenders. In terms of how it looks, there’s an exposed engine cover to show off the beast underneath, whilst the front-end looks supremely futuristic. The car features a new Super All Wheel Control driveline that has the usual Active Steering, Suspension and braking controls. Going to the engine, there’s a 2.2 litre, 4-cylinder, 16 valve common rail turbo diesel. It features a maximum output of 201 horsepower and 310N/m of torque. No doubt when this car comes into production (we’ve seen concepts like this come to light before) we’ll see even more power. Mitsubishi has long been known for driving sports saloons of the future, and I’m sure this will be no exception. Judging by the way things are going, I’ll not be surprised at all if most cars on the road of the future end up being diesel, gas or some other alternative fuel. As engines get better and better, there’ll be less need to rely on petrol engines or indeed the pollutants they produce. More id Software coming to Xbox Live Marketplace? MacBook Pro – A Good Buy?